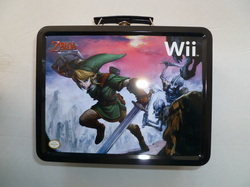 Whether they are lunch boxes or collectible tins, you can find them all here! 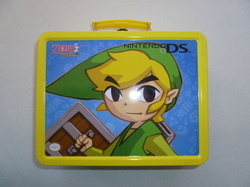 My Zelda lunch boxes and collector's tins will be loosely categorized and will be listed from oldest to newest in each category. 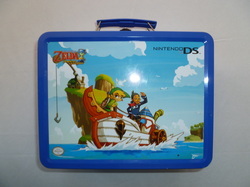 Other Info: This lunch box and thermos, made by Aladdin in 1989 for Nintendo of America. They feature the artwork from Super Mario Bros. 2 and The Adventure of Link. On the front of the box it shows the Mario Brothers sitting on a couch, their feet up, a bowl of pop corn on the table, and The Adventure of Link game on the TV. 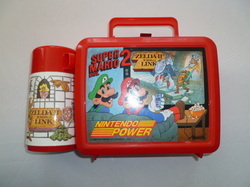 The thermos has has a 2-sided design with The Adventure of Link on one side, and Super Mario Bros. 2 on the other. The lunch box and thermos kit comes in colors of red and blue.